SMART PROTECTION - Built-in protection circuit actively manages battery performance during charging and discharging. Helps detect and prevent over-charge, over-discharge, short-circuit, or over-current by shutting off the device or charger. CERTIFIED FOR SAFETY - Extensively tested and certified by the most stringent battery safety standard: UL 1642, UL 2054, UN 38.3, IEC 62133, UL 60950, Battery Directive (2006/66/EC), CSTCG (PI965). 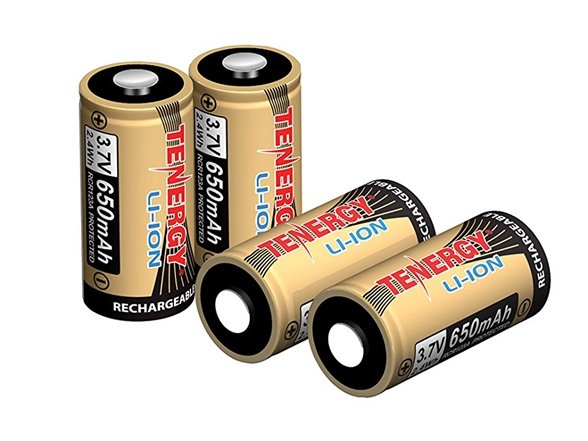 This Tenergy Li-ion rechargeable RCR23A battery is intended for use in security camera only. Do not use the batteries in any flashlights or any device that require high power or high current drain. Do not mix use this Tenergy Li-ion 3.7V 650mAh rechargeable RCR23A battery with any one-time use Lithium CR123A batteries, for example Panasonic or Duracell Lithium CR123A.